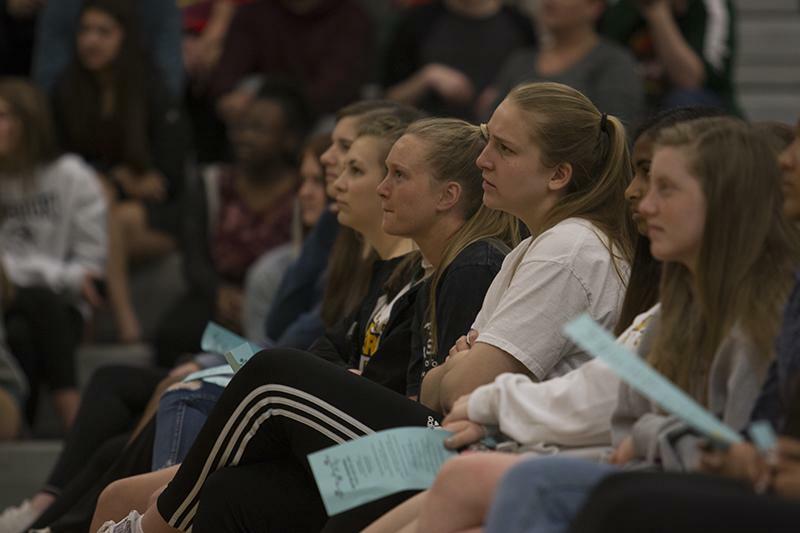 Students watch as Student council officer candidates make speeches at the spring assembly Friday, April 5, Photo by Gabi Tella. At the spring assembly Friday, April 6, Student Council (StuCo) presented candidates for next year’s student government officers. Students running for president, vice president and treasurer all made speeches. Unlike previous years, StuCo allowed rising juniors to be a part of the running for an officer position. StuCo sponsor Kelley Wittenborn said no current juniors in the group were interested in becoming treasurer, so she thought of opening the spot to sophomores in student government. This was due to the fact that current sophomores would have one year of experience in StuCo, which is a requirement of filling the position, Wittenborn said. Current officers did not weigh in on the decision, as the final outcome “won’t affect them,” Wittenborn said. Officers, Wittenborn said, play very large roles in StuCo, as they are in charge of major planning and orchestrating of the year, including events, philanthropy and fundraising. They also meet weekly with Wittenborn to discuss upcoming events and are role models for other StuCo members, the senior class and the school. When coming up with the final plan of who should be able to run for StuCo treasurer, Wittenborn had to consider who would have the best fit the role, would benefit the student body and come in with a solid background already in student government. Wittenborn told the current sophomores in a meeting Wednesday, April 3 that they could run for the position. Sophomores Garrett Roach, Peyton Brooks and Claire Swindle took the opportunity. All said they jumped at the chance to become a leader in StuCo. For the dynamic of StuCo and having a junior as one of the four leading officers, Roach sees the change in authority as strange but nothing that will change the current climate or structure. All three candidates showcased their platforms at the spring assembly with speeches. Each sophomore described their own reasons for running and why they would best fit the role of treasurer. Current freshmen, sophomores and juniors can vote for StuCo president, vice president and treasurer on the RBHS homepage. Voting ends Tuesday, April 9 at 2 p.m. and StuCo announces the positions at 4 p.m. the same day. I liked all of their speeches and I wish the best of luck to these candidates!